YouTube is the Internet's second most popular search engine. Google bought YouTube for a reason. Consumers are growing ever more leery of brands without video content or channels. Animoto is Web-based video production and photo slideshow software. Platform: Browser-agnostic, iOS, Android apps. 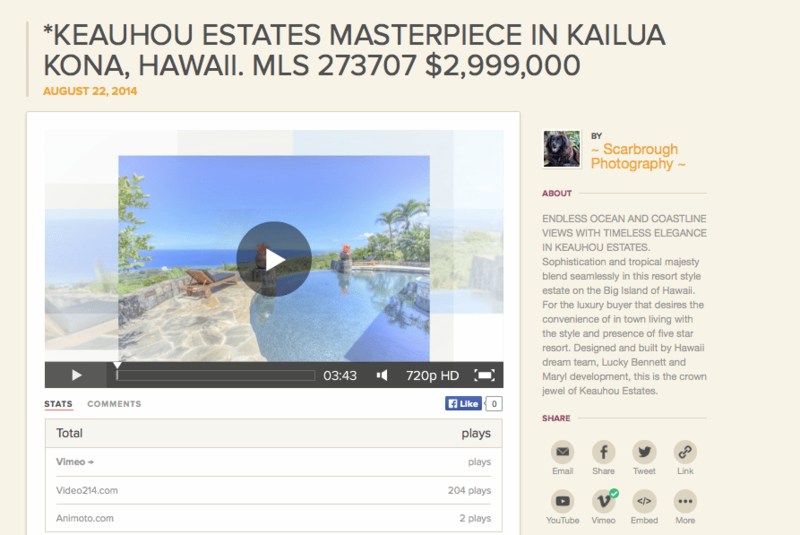 Ideal for: Any agent, team or brokerage wanting to add video and professional slideshows to their marketing mix. Video and slideshow production is drag-and-drop. There are more than 2,000 included music tracks. Music selections can be automated based on flow and theme of project. Call to Action feature won’t display on YouTube videos. However, that’s an issue with YouTube’s practices, not Animoto. It’s just getting too easy to not be marketing with video. 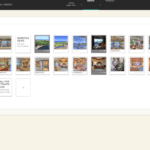 Animoto uses a photo gallery-like interface to allow users to drag and drop uploaded photos and videos into sequence. Users can assemble basic slideshows with text and soundtracks, or actual videos interspersed with listing photography and copy. Title cards can be added in between images; text can be inserted to describe home features; and logo bumpers can open and close each project. Music options are plenty, and Animoto employs some behind-the-scenes magic to select the best musical “backbone” for you according to the flow of your visual arrangement. A YouTube channel may be your best platform, but it shouldn’t be all you think about when it comes to video outreach. The software doesn’t use a highly technical, timeline-based editing user experience. You don’t have to worry about sound levels or deleting background noise. This is a simple tool to make your marketing look sophisticated. The template selections are categorized like a PowerPoint presentation, according to theme or larger category, like “business,” “education” or “photography.” The company’s in-house design team is always working on fresh designs. High resolution isn’t a problem. Animoto supports 480p, 720p and 1080p, depending on account level. 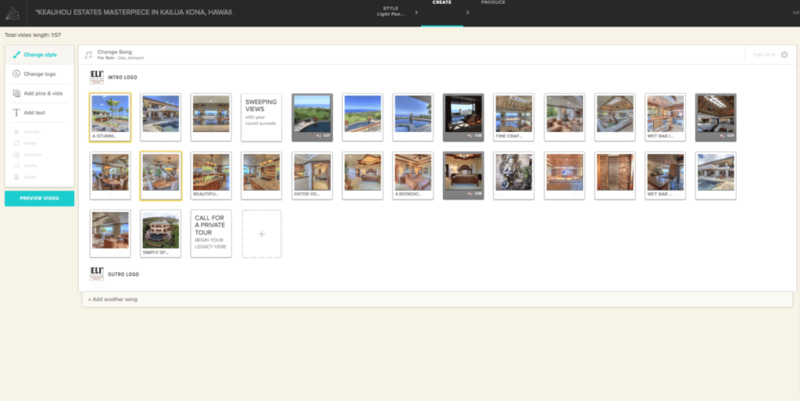 Overall, the look and feel of Animoto will appeal to most users. It’s clean and uncluttered. Users are provided an array of venues on which to premier their project. 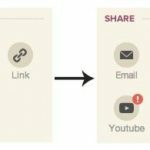 Animoto’s sharing options include all major social media platforms, as well as YouTube, Vimeo, Tumblr, WordPress and Pinterest. Videos are now considered standard marketing tools. Do you use them? 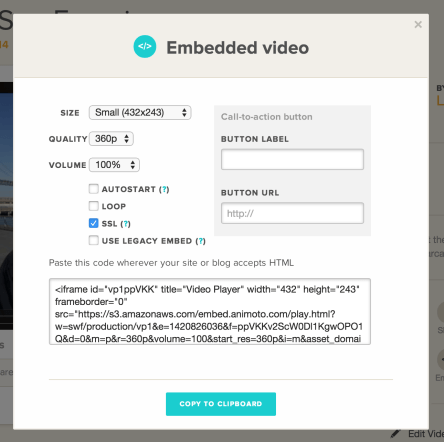 Embed options can be adjusted to ensure viewing compatibility with various publishing outlets. 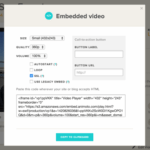 Animoto’s Call to Action button can be inserted using custom text and links when videos are published on your account page. Agents would be well served to connect these videos directly to email capture forms. Metrics are included to provide an idea of your audience’s interest. Animoto also connects to Dropbox accounts, Picasa, Adobe Lightroom, Photobucket and Flickr. The company has more than 50,000 companies employing its software around the world. It wasn’t specifically built for real estate agents, but the overlap is obvious. The ways to leverage this kind of video tool are too many to mention. Between tools like the mobile-first Busivid, REClarity and now Animoto, agents’ options to do more with rich media and video are impressive. Let’s see more of it. What do you think? Now will you start using video? Have a technology product you would like to discuss? Email Craig C. Rowe.